How many BTUs are in a kilowatt-hour? How many barrels of oil equivalent (BOE) are in a kiloton of TNT? There are a lot of different units of energy and power. Which one is chosen at a particular time depends on the field and the customs of its experts. It can get a little confusing when comparing numbers from practitioners in different fields. It can be very eye opening to make the conversions. For example, six sixteen watt CFL bulbs lit up for six hours will use as much energy as released by the detonation of one pound of TNT. My preference is to convert powers to watts and energies to watt-hours. Brightsource’s Ivanpah Solar Electric Generating System in California is a case in point. This is a solar thermal site that uses thousands of mirrors to concentrate sunlight to generate heat to run generators. Smithsonian.com says the “$2.2 billion Ivanpah Solar Electric Generating System—the largest of its type in the world—will power 140,000 California homes.” It looks like they are using a “home” as a unit of power. What does “will power 140,000 California homes” really mean? According to the EIA, the average home in California consumes about 7000 kilowatt-hours of electric energy each year (most recent data, 2009). That means 140,000 homes would use 9.8 x 108 kilowatt-hours (9.8 x 105 megawatt-hours) of electric energy per year. I think we’re on the right track here, because the National Renewable Energy Laboratory says Ivanpah will produce 10.8 x 105 megawatt-hours per year. I think it is bad practice to use two mix different units for energy (kilowatt-hours and Btu) as the EIA has done with these graphs. How many people can compare kilowatt-hours and Btu by looking a graphs? The graph on the top left is where I got the estimate of 7000 kilowatt-hours of electrical energy per year for the average California home. Notice that it is labled “ELECTRICITY ONLY.” The graph on the lower left is for “ALL ENERGY average per household,” and indicates about 62 million Btu per California home per year. You might think that providing enough energy for 54,000 homes is still pretty impressive and makes a big dent in California’s energy needs. Think again. There are 12.5 million households in California. So it would take about 240 (≈12,500,000/54,000) Ivanpahs to power them all. Ivanpah covers about 16 square kilometers. So it would take about 3600 (= 16 x 240) square kilometers to power all these households. Building 3600 square kilometers of mirror arrays is a big undertaking, but wouldn’t it be worth it to power the entire state of California? The problem is that it wouldn’t power the entire state of California. Residential power consumption is only about 20% (1/5th) of California’s total energy consumption. Far more energy goes into commercial, industrial and transportation needs. If we assume vast efficiencies then we might say that it only takes 2.5 times (instead of 5 times) the residential energy consumption to run the entire state of California. With these assumed efficiencies Ivanpah would provide the total (not just residential) energy needs for the occupants of only about 22000 (≈ 54000/2.5) homes. It would take nearly 600 (≈2.5 x 240) Ivanpahs, a whopping 9000 (≈ 3600 x 2.5) square kilometers of mirror arrays, and $1.3 trillion (≈ 2.5 x 240 x $2.2 billion) to provide the average energy needs of the entire state. The use of “home” as a unit of power has a warm and fuzzy feeling to it. I guess good and caring people are concerned about “homes,” while cold and uncaring people talk about “kilowatt-hours.” Using “homes” as a unit of power gives the impression (intentionally?) that all the energy needs of the people living in those homes are met. It is much more impressive to say an energy project will “power 140,000 homes” than to say it will compensate for the total energy needs for the people living in 22,000 homes. I believe this loose use of the English language and lazy, imprecise use of physical values is used precisely because it yields more impressive numbers. 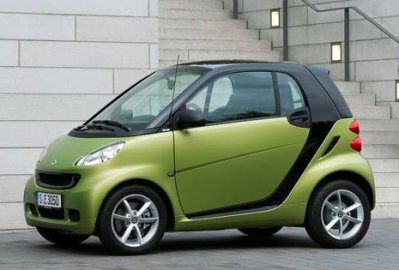 The top car is the mis-named “Smart Car” from Daimler AG. 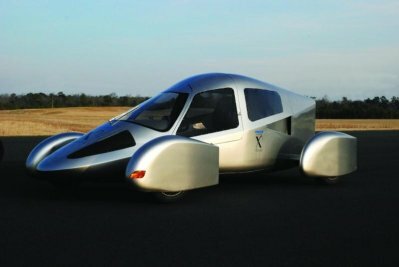 For somewhere between $12,000 and $20,000 you get a vehicle that carries two people gets 33 mpg city and 41 mpg highway for a combined 36 mpg. That’s almost 85% of the fuel economy of a Honda Civic – fifteen years ago. has plans for a car that is closer to being production ready, with bodywork that sounds more substantial. Should it progress to production, the car could be offered in the $20,000 range. The call is yours, which would you rather drive? 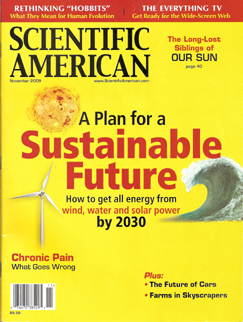 The cover story of the November issue of Scientific American, A Path to Sustainable Energy by 2030,” by Mark Z. Jacobson and Mark A. Delucchi promises a path to a “sustainable future” for the whole world in just 20 years. They define “sustainable” as a world where all energy sources are derived from water, wind and solar. Nuclear need not apply. The article had a few words about the cost, but much was left out. Jacobson and Delucchi conclude that their grand plan will cost about $100 trillion dollars. I found this ridiculously large sum to be too low! My rough calculations yields a cost of $200 trillion! This post is an attempt to fill in a few blanks. I will accept the authors’ mix of energy sources, apply some capacity factor estimates for each source, throw in an estimate of the land required for some sources, and estimate the installation cost per Watt for each source. Since all of these numbers are debatable, I provide references for most of them. But some of the numbers are simply my estimates. Also, I consider only installation costs. I do not consider the additional costs of operation and maintainance, which may considerable. Another point, the authors say that the US Energy Information Administration projects the world power requirement for 2030 would be 16.9 TW to accomodate population increase and rising living standards. By my reading, the Energy Information Administration’s estimate is actually 22.6 TW by 203013. Nevertheless, Jacobson and Delucchi base their plan on only 11.5 TW, with an assumption that a power system based entirely on electrification would be much more efficient. I will go along with their estimate of 11.5 TW for the sake of argument. The numbers that I have placed in the blue columns are open to debate, but I am fairly confident of the capacity factors. The capacity factor for concentrated solar power, with energy storage, such as molten salt, can vary depending on interpretation. If energy is drawn from storage at night, then the capacity factor could be argued to be higher. On the other hand, it would result in greater collection area, collection equipment and expense. Note that using my estimates for capacity factors, the “total real power” works out to 12.03 TW, close to Jacobson’s and Delucchi’s 11.5 TW. The dollars per installed watt is where I would expect the greatest argument. For example, Jacobson and Delucchi call for 1.7 billion 3000 watt rooftop PV systems. That is residential size, on the order of 300 square feet. You can find offers for residential systems at much lower rates than $8 per watt installed. But this is because of rebates and incentives. Rebates and incentives only work when a small fraction of the population takes advantage of them. If every residence must install a photovoltaic system, there is no way to pass the cost on to your neighbors. 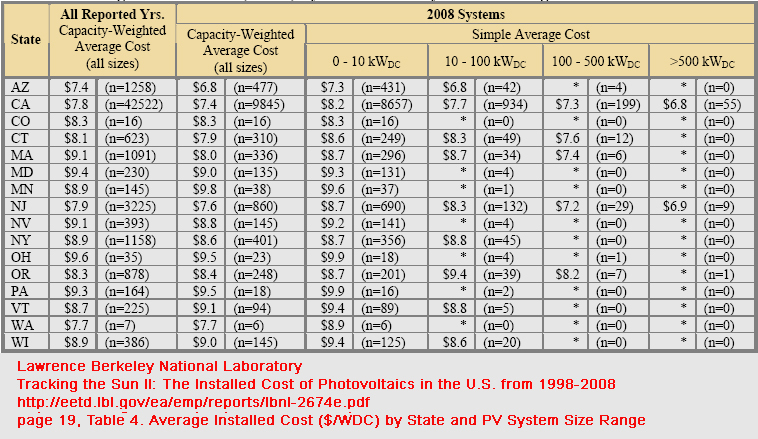 Click on the chart on the left, from Lawrence Berkeley National Laboratory: of all the states listed, only one comes in at under $8 per installed watt for systems under 10 kilowatts, and half of the remaining come in at over $9. Wouldn’t prices fall as technology advances? Not necessarily. 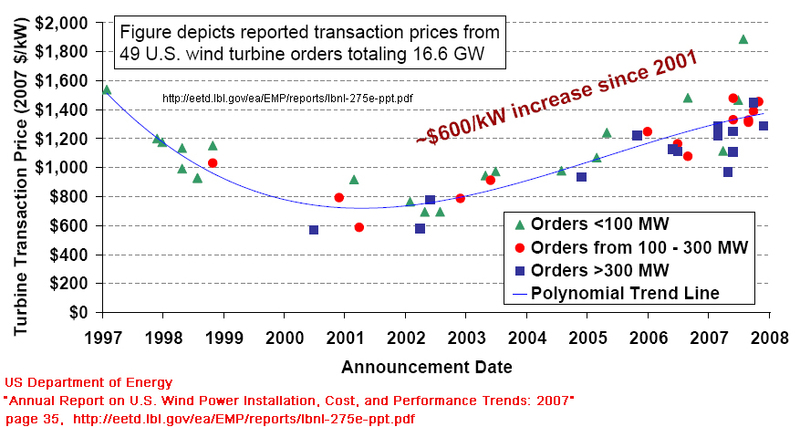 Look at the cost to install wind facilities – it has been increasing since the early 2000s. A large part of the installed price for wind is the cost of the wind turbine itself. Click on this graph showing the price of wind turbines per kilowatt capacity. This increasing trend will likely continue if demand is artificially pushed up by a grandiose plan to install millions more wind turbines beyond what are called for by the free-market. Expect to see the same effect for photovoltaic prices. While the cost of photovoltaic power has been slowly falling, the demand (as a fraction of the total energy market) has been miniscule. Jacobson and Delucchi call for 17 TW of photovoltaic power (5 TW from rooftop PV and 12 TW from PV power plants) by 2030. Compare that to the what is already installed in Europe, the world’s biggest marked for PV: 0.0095 TW. Achieving Jacobson’s and Delucchi’s desired level would require an orders or magnitude demand increase. This is likely to lead to higher prices, not lower. For my calculations I am staying with today’s costs for photovoltaics. We have started using the word “trillion” when talking about government expenditures. Soon we may become numb to that word, as we have already become numb to “million” and “billion.” My estimate for the cost of Jacobson’s and Delucchi’s system comes out to about $210 trillion. So how much is $210 trillion dollars? It is approximately 100 times the $2.157 trillion of the total United States government receipts of 2009 (see documentation from the Government Printing Office) . It is about 15 times the GDP of the United States. What about just the United States? Jacobson and Delucchi calculate that with their system the US energy demand with be 1.8 TW 2030. Keep in mind that the demand today is already 2.8 TW. If we accept their estimate of 1.8 TW, then that is about 16% of their estimated world demand of 11.5 TW for 2030. So roughly speaking, the US share of the cost would be 16% of $210 trillion, or about $34 trillion. That is 16 times the total United States government receipts of 2009. Doesn’t seem to likely to work, does it? I know that Jacobson and Delucchi don’t like nukes. But the Advanced Boiling Water Reactor price of under $2 per installed watt sure sounds attractive to me now. Just a thought. Jacobson and Delucchi compared their scheme to the building of the interstate highway system. See here for are realistic comparison. 10) I have chosen a low cost because most hydroelectric has already been developed. 12) Based on my personal experience as a Scientist working on photovoltaics for 14 years at the National Renewable Energy Laboratory. This number varies according to insolaton, latitude, temperature, etc. 13) The EIA predicts a need for 678 quadrillion (6.78 x 1017) BTUs of yearly world energy use by 2030. One BTU is the same as 2.9307 x 10-4 kiloWatt hours. So, (6.78 x 1017 BTU) x (2.9307 x 10-4 kWhr / BTU) = 1.98 x 1014 kWhr. One year is 8.76 x 103 hours. So the required world power would be given by: (1.98 x 1014 kWhr) / (8.76 x 103 hr) = 2.26 x 1010 kW = 22.6 TW. I am told humans are smart, but sometimes I wonder. I was born back in ’02, and I have learned a trick or two in my 49 years. But this old dog will never play the kind of trick that Brenda and Robert Vale are playing. They are off by a factor of 20 when comparing the energy to power an SUV with the energy to power a dog. The couple have assessed the carbon emissions created by popular pets, taking into account the ingredients of pet food and the land needed to create them. In a study published in New Scientist, they calculated a medium dog eats 164 kilograms of meat and 95kg of cereals every year. It takes 43.3 square metres of land to produce 1kg of chicken a year. This means it takes 0.84 hectares to feed Fido. They compared this with the footprint of a Toyota Land Cruiser, driven 10,000 kilometers a year, which uses 55.1 gigajoules (the energy used to build and fuel it). One hectare of land can produce 135 gigajoules a year, which means the vehicle’s eco-footprint is 0.41ha – less than half of the dog’s. Let me help my two-legged friends with their calculations. Let’s compare the amount of land needed to generate enough biofuel to drive a Toyota Land Cruiser 10,000 km, to the amount of land required to feed a dog. Let’s compare kibbles to kibbles. In the case of the Land Cruiser grain may be converted to ethanol to power the vehicle. Similarly, grain can be fed to animals to yield meat, which can be fed to the dog. The humans at Toyota say that the Land Cruiser gets 13 miles (20.8 kilometers) per gallon in the city and 18 miles (28.8 kilometers) per gallon on the highway. But that is when it runs on gasoline. The energy content of gasoline is 115,000 BTU/gallon. But for ethanol it is only 75,700 BTU/gallon. So it takes about 50% more ethanol to get the same energy. *** That is, the Land Cruiser would only get 8.6 miles (13.8 kilometers) per gallon of ethanol in the city and 11.8 miles (18.9 kilometers) per gallon of ethanol on the highway. **** Let’s average it and call it 10.2 miles (16.3 kilometers) per gallon of ethanol for the Land Cruiser. 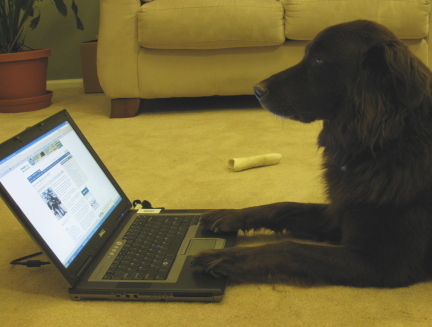 According to the boneheaded professors, a typical dog eats 164 kilograms of meat per year. (I have a pretty good life – but I can tell you I don’t eat nearly that much. But I’ll play along anyway.) That would require 0.052 hectares to produce.+++ They say that we also eat another 95 kilograms of cereals each year – or another 0.01 hectares worth of corn.++++ That sniffs out to 0.062 hectares worth of land to feed an overfed dog. 0.61 hectares to feed the soulless Toyota Land Cruiser. 0.062 hectares to feed your best friend. That’s 10 times as much for the Land Cruiser than for me. I could have sworn the professors said the dog required twice as much land as the Land Cruiser. They were only off by a factor of 20. Bad professors, BAD. Don’t make me rub your nose in it. * (151.1 bushels / hectare) x (2.46 acres / hectare) = 371 bushels per hectare. I compared a new14w CFL designed to replace a 65W incandescent recessed light (Commercial electric, model EDXR -30-14) and an new 65W incandescent recessed light (GE Reveal 65) by measuring their spectra with a NIST traceable calibrated spectroradiometer. In each case the bulb pointed down, like a typical recessed light, with the spectroradiometer measurement point 108 cm below the bulb. The measurement was repeated seven times for each bulb: first with the spectroradiometer directly below the bulb, then with the spectroradiometer moved about 15 cm horizontally, then 30 cm horizontally…out to about 90 cm horizontal shift. Note that the GE Reveal 65 had an “enhanced color spectrum that used a neodymium glass filter to reduce the amount of light in the middle part of the visible spectrum to yield more vivid reds and blues. I would have been better off with a simpler incandescent lamp for this comparison. 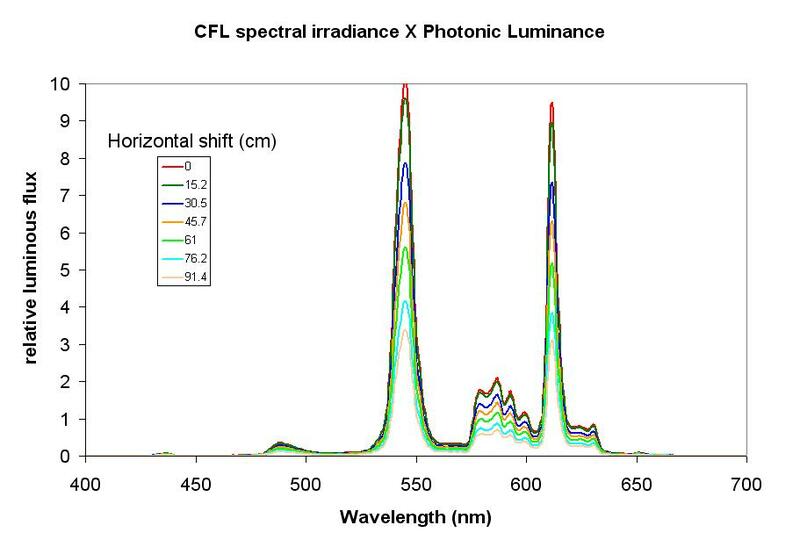 The first graph below shows the spectral irradiance for the CFL. Note that most of the irradiance is in the visible part of the spectrum. The seven curves correspond to the seven horizontal positions, with the highest irradiance being directly below the bulb. The second graph is the same, but zoomed in to the visible part of the spectrum. The following two graphs show the same thing for the incandescent lamp. Notice the dip in the middle of the visible spectrum. This is due to the neodymium glass filter. 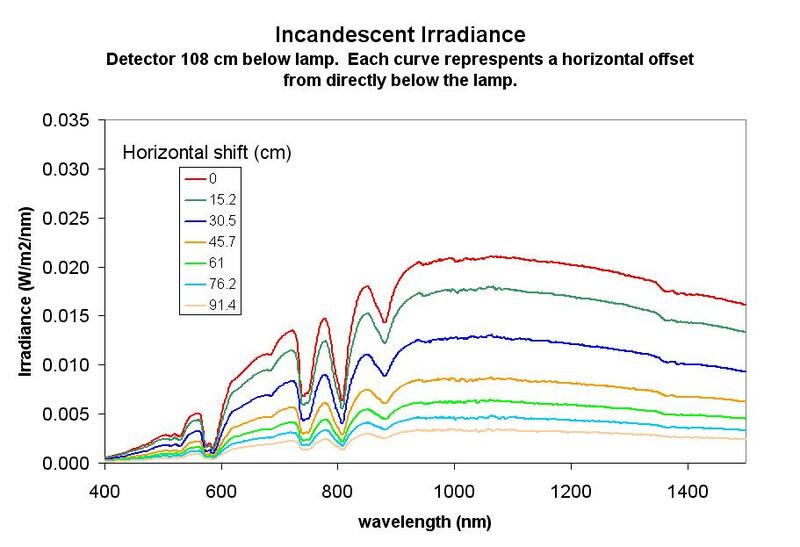 If that filter were not present the total irradiance of the incandescent lamp would have been higher. I will repeat this experiment at a later date with the simpler incadescent lamp. Irradiance only tells the beginning of the story. The human eye is more sensitive to some colors than to others. It is more sensitive to the middle of the visible part of the spectrum than to the red or the blue. Of course, it is totally blind to the UV and the IR. So, the irradiance is multiplied by a Luminosity Function and a constant to give a measure of how bright a light is. The following plot shows the typically used Photonic Luminosity function. 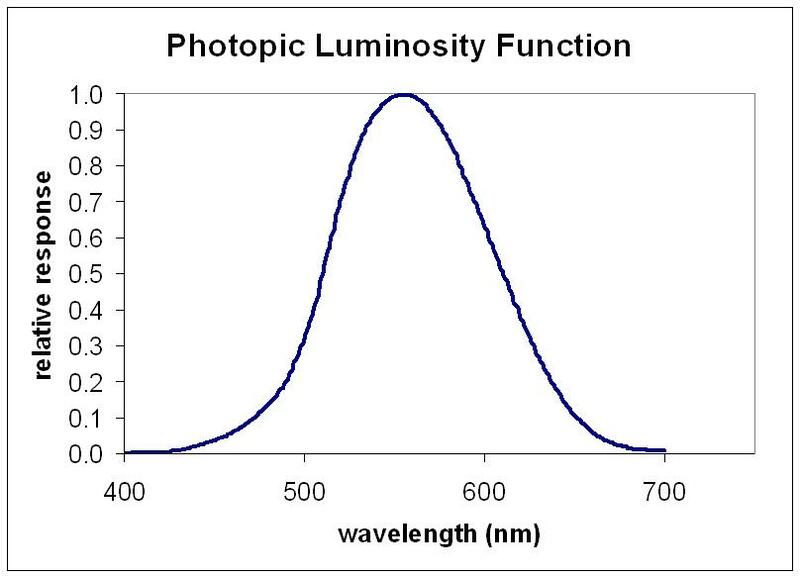 The following two graphs show the products of the Photonic Luminostiy function, a constant (683 lux/W/m2), and the spectral irradiance of the CFL and the incandescent bulbs. 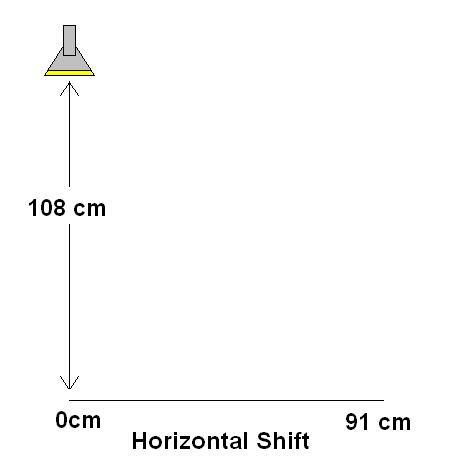 The total area under any curve gives the “brightness” for the lamp at a particular horizontal shift. I have deliberately left the Y axis the same on both graphs to make them easier to compare. 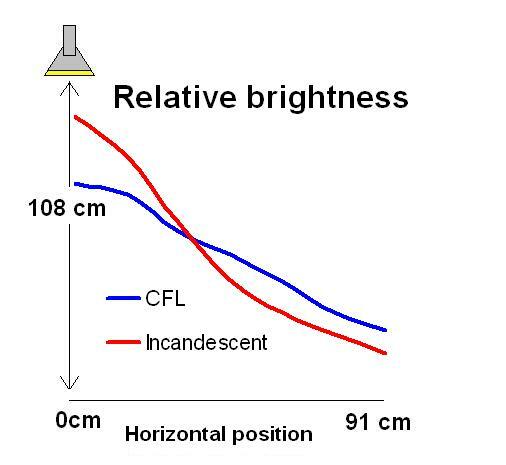 It is clear that the CFL is very bright over two narrow wavelength bands centered on about 545 nm and 620 nm, while the incandescent light is spread more evenly over the visible spectrum. This is probably why people feel that colors look less natural under a CFL. After all the graphs and the math, which light is brighter? It depends on the horizontal position, as shown in the following figure. The incandescent is brighter directly below the lamp, but the CFL is brighter off to the sides. This should not be too surprising, because the light from the incandescent comes from a small filament, which is more easily reflected in the same direction than the light from the extended source of the CFL. But when integrated over all directions, the incandescent and the CFL are probably a very close match, as claimed by the CFL manufacturer. It would be interesting to repeat this experiment with bulbs that have accumulated about 1000 hours. But that is an experiment for another day. 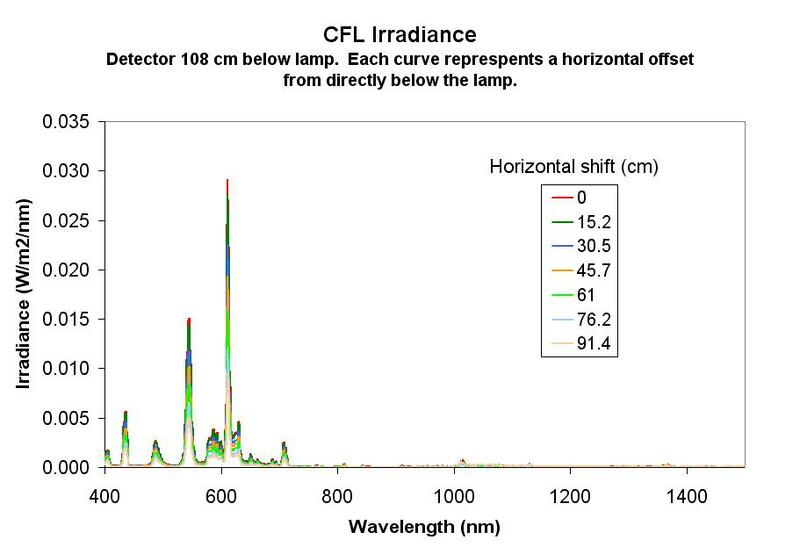 I also measured the irradiance of the CFL as a function of time. This was done for the lamp after it had been off and cool for hours, and again after it had been fully warmed and then allowed to cool for three minutes. 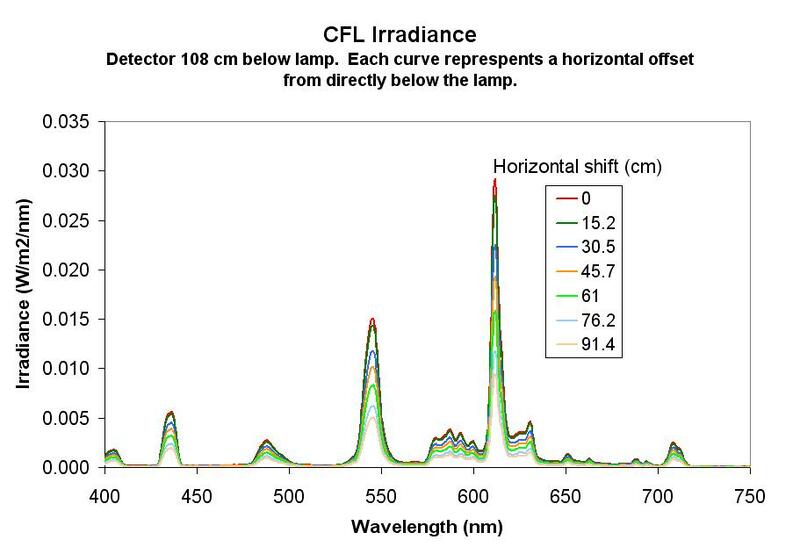 It takes about 4.5 minutes to get to full irradiance for a cold lamp, and about 3 minutes for a warm lamp. Of course, the warm-up time for the incandescent is essentially zero minutes. There are hundreds of different configurations of CFLs and incadescent bulbs being used in the world. My sample is miniscule. However, some of my numerical results are probably fairly representative, and there are common observations reported by many users. As shown above, at least in my case, the 14 Watt CFL was about a bright as the 65 Watt incandescent it was designed to replace. However, the color quality of the CFL was much poorer. This poor color quality is a function or the flourescent nature of the lamp, and is likely common to most CFLs. The CFL takes a long time to warm up, compared to the instant-on of an incandescent. 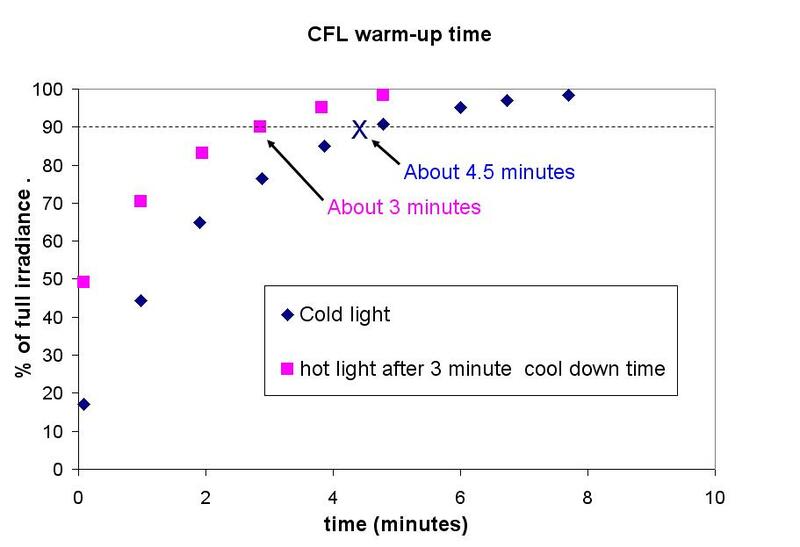 The warmup time probably varies from one type of CFL to another. I have data to indicate that the irradiance vs. time for the warmup minutes can look quite different for a new CFL vs. and an identical CFL with several thousand hours, but that data is not presented here. As indicated in a previous post, my experience is that a CFL will save money compared to an incandescent that it is designed to replace. But as shown here, the color quality of the light is worse and there may be an annoying wait for it to warm up. I will continue to use CFLs where they make sense, but I am also stockpiling some incandescents for the day when they are no longer available by government mandate. Short duration use of many CFLs reduces their lifetime, and as seen above, it may take several minutes for the CFL to get to full brightness. So I will use incandescents in closets and storage rooms, etc., and CFLs in the main living areas. I have presented this information as a small part of a large issue. My endorsement of CFLs, despite some of their drawbacks, is most definitely not support for the government mandate to force us to use CFLs. I am stockpiling incandescents for certain situations and would suggest that others do the same. Perhaps the price of LEDs will drop enough to make this issue irrelevant. Ultimately, I would like to see abundant amounts of energy available to all Americans and to all the people of the world. Then the issue of light bulb choice would simply be moot. My fear is that we are moving in the opposite direction. Here is a simple, fun, 10 question quiz that covers a sample of climate change and/or energy issues. Simply check the appropriate box and push the “vote” button for each question. After you have pushed the vote button you will see the accumulated wisdom of everybody who has answered that question so far. 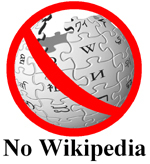 You can even leave a comment for any question, which I encourage. Note that several of the questions requiring numerical answers have “order of magnitude” choices. That is, they require “back of the envelope” type approximations, not high precision. At the bottom of the quiz you will find a link to a solutions page, with links to supporting evidence, and “back of the envelope” calculations. If you want, you can look at the solutions first and then take the quiz – but that would be cheating! After enough people have answered the questions I will post the results at ClimateSanity. Here are five false color images of the sea ice in the arctic. The images represent the ice on five year intervals on July 18th of 1988, 1993, 1998, 2003, and 2008. Your task is to use your knowledge of changing conditions in the Arctic to put them in the proper chronological order. Note that each image uses the same color scale (shown in the upper left corner of each image) to indicate the density of ice as a function of position. 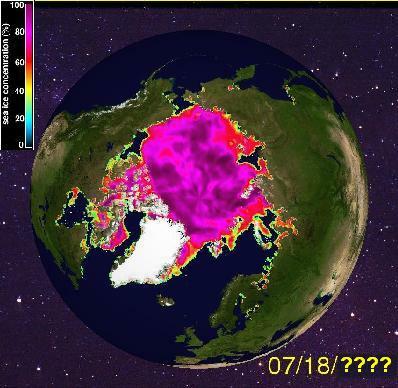 In the fall of 2007, after the northern summer melt season, the Arctic sea ice extent anomaly reached its lowest level since satellite monitoring began in 1979. 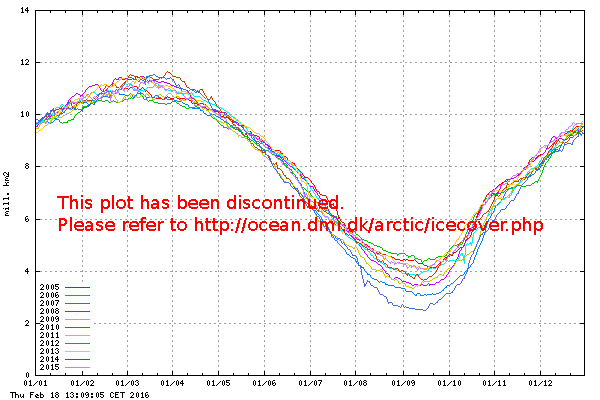 This was followed by warnings that the Arctic ice could be completely gone by the summer of 2012. In 1979 the worst nuclear accident in US history happened at Three Mile Island nuclear power plant near Middletown, Pennsylvania. A rising sea level is one of the feared symptoms of global warming. According to the Jason and Topax satellite tracking of ocean levels, the average sea level rise rate for the last 10 years has been about 3.2 mm per year. This is interpreted by some to indicate an accelerating sea level rise rate. IPCC expert Simon Holgate’s 2004 data (Holgate, S.J., and P.L. Woodworth, 2004: Evidence for enhanced coastal sea level rise during the 1990s. Geophys. Res. Lett., 31, L07305, doi:10.1029/2004GL019626.) was prominently featured in the IPCC’s Fourth Assessment Report (AR4, Working Group 1: The Physical Science Basis of Climate change, Chapter 5). In a more recent 2007 paper (S.J. Holgate, “On decadal rates of sea level change during the twentieth century“, Geophysical Research Letters34: GL019626 (2007)., Holgate reconstructed sea level rise rates from high quality tidal gauge data going back to about 1900. NASA Scientist James Hansen estimated a sea level rise of 15 feet for the 21st century. The northern coast of Greenland is at 83.5 degrees north latitude. It is the closest land to the North Pole. Satellite data since 1979 has always shown this region locked in sea ice. If global warming were to result in an ice free arctic sometime during this century, it is believed that this area would be the last place to lose its summer ice. Compact fluorescent light bulbs use only 25% of the energy of an incandescent light bulb to give the same number of lumens of light. Since 1963 Africa’s Lake Chad has experienced severe shrinkage. While atmospheric CO2 levels have continuously increased since 1963, the surface area of the lake has dropped from about 25,000 square kilometers to about 1,500 square kilometers. This fact has been presented by Al Gore and others as a consequence of anthropogenically induced global warming. Of course, this evidence must be considered in comparison to how the lake was changing when CO2 levels were not increasing.